Dakshinkali Temple is located about 22 km from central Kathmandu. 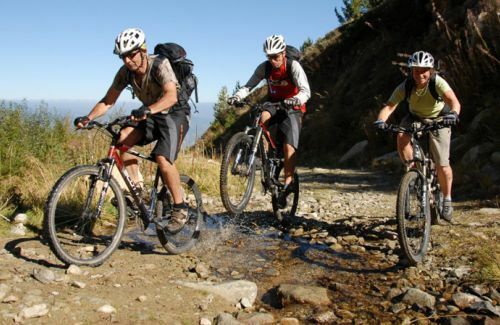 The cycling tour to Dakshinkali doesnot only focuses to Kali temple but also includes the tour to Tau daha, Chovar Gorge, Jal Binayak Ganesh Temple, Pharping, Sheshanarayan , Monasteries around there and Dakshinkali temple in the confluence of Punyawati and Uddarwati streams. The road leading to the temple presents many picturesque rural views and interesting places like: Kirtipur which comprises the ancient fortress, Uma devi Temple, Bag Bhairav temple, Chilancho Bihar and Ashoka Stupa etc. The famous temple Adi Nath was built in the Lichhavi period is in the next hill. The main road can be met while descending from Adi Nath towards to Chovar hill where there is the gorge, said to have been cut through the hill by the great Buddhist monk from Tibet, Manjushree with his divine sword and the water drain out. There is small suspension bridge over the gorge. Now the vehicle crosses to Lalitpur from the newly constructed bridge. Tau Daha near to gorge, is known for its clear water and migratory ducks from Siberia. Fish also abound in it. After Taudaha Lake, the road goes uphill and reaches to a famous religious sanctuary located in a calm and scenic setting. Hindus call it Sheshanarayan and Buddhists call it Yanglesho. Elongated rock formations which hang high above Sheshanarayan temple are said to represent the snakes which once taunted Padmasambhava as he meditated here. The distance by road from Sheshanarayana to Dakshinkali is about 2 km. This is very powerful Hindu Shaktipeeth where animals are sacrificed. You can ride up above the Pharping hill and can back to Kathmandu. Day 01Ride from Kathmandu to Dakshinkali and cycling around and back to Hotel. Overnight stay at hotel in KathmanduWith fully conditioned cycle and some extra spare parts and tools , we begin our cycling to Dakshinkali, 22 km south from Thamel, Kathmandu. We follow the Dakshinkali road passing Tribhuban University Gate, Chobhar Gorge. This is the only gorge in Kathmandu from where the water drains out of the valley. There are caves, Ganesh Temple and the park to visit. After this, after a km, we can see the Taudaha, the only lake in Kathmandu, respectfully made for the King snake of the valley after it was drained out by Manjushree. Well, after a while, we reach to Sheshanarayana. There are lot more things to discover at Pharping like monastery, Padmasambhava Cave and others. Finally, we can descend to Dakshinkali Temple and observe the ritual ceremony going on there. It is the popular Shakti Peeth in Nepal where animal sacrifice is done. We can have lunch somewhere and ride back to Kathmandu.